Investors were given a pleasant surprise last quarter. Will the third quarter offer up a repeat? Best Buy (NYSE:BBY) is scheduled to report earnings on Thursday. Entering the critical holiday shopping season, the stock has rebounded, especially after the summer quarter showed a surprise profit from one-time items. Critical to this week's report will be an update on same-store sales, internet sales, and an outlook for the all-important winter months. It's been a tough road for the stock since it reached peak prices in 2006. 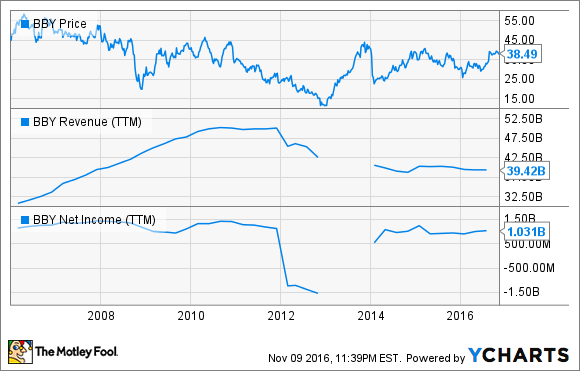 Since then, Best Buy has struggled to recapture any meaningful top- or bottom-line growth. The main culprit? The advent of online sales and the ability for consumers to research purchases and compare pricing has put a damper on the big-box store's prospects for full recovery. That's not to say Best Buy isn't also making hay off internet sales. The company has sported double-digit growth from domestic online selling, and so far this year the growth trend has picked up the pace. Chart data source: Best Buy quarterly earnings reports. YOY = year over year. The real problem has been declining revenue in-store, including the closure of a large part of its underperforming Canadian business in 2015. The growth in online merchandising hasn't been able to keep up with physical-location declines. Shares have been rebounding this year on better-than-expected profitability numbers, but those have been driven by cost-cutting and a continued transition to lower-overhead internet sales. Top-line revenue growth has continued to be elusive for the retailer. When the company reports on its August-through-October quarter, investors will want to key in on internet sales growth, whether that growth can help move the revenue needle higher, and how things are shaping up for the winter quarter. CEO Hubert Joly has stated that 2016 is a year of "exploration and experimentation" as the company tests a few new initiatives. In the meantime, the company launched a new mobile shopping app last year, with new features aiming to make the shopping experience easier and more helpful. So far it has helped accelerate digital sales growth, and an indication that trend is continuing will be important, as it has been offsetting the bleeding from declining foot traffic in stores. Despite the recently launched online sales efforts, the company is still trying its best to get customers to show up in person. A few pilot programs include an in-home advisor program in select markets, which involves a consultation with an advisor to help clients identify and solve technology needs. Also in the works are in-store classes on topics spanning from digital photography to home automation. After back-to-back quarters of 20%-plus online growth, comments made during the last report seem to indicate a refocus on the traditional store format. This makes sense, as it has been the primary drag for Best Buy. Even so, it seems that the company is still looking for the right recipe that works. Investors will want to look for evidence that something is sticking. Is it time for investors to move on? It's been easy to be critical of the king of retail electronics for some time. Best Buy has struggled against consumers losing interest in shopping in physical stores, but to very little avail. If business doesn't show any signs of improvement, or if management issues another lackluster outlook for the end of the year, it may be time for investors find a different retail stock to own.